Resolved issues with the City of Evanston and has maintained a professional relationship with the municipality. Has worked closely with the Architect and has provided value engineered solutions to various construction challenges. Provided a high level of communication with weekly reports, weekly meetings, pictures and written communication between us as Owners and also our design team. Maintaining a written construction schedule and report that is reviewed on a weekly basis. Maintain a written budget along with change order reviews and all necessary documentation. Provided excellent support with the use of an on-site Project Manager and a Site Superintendent. Submit accurate payment applications on a timely basis. They have proven that they do what they say they are going to do." 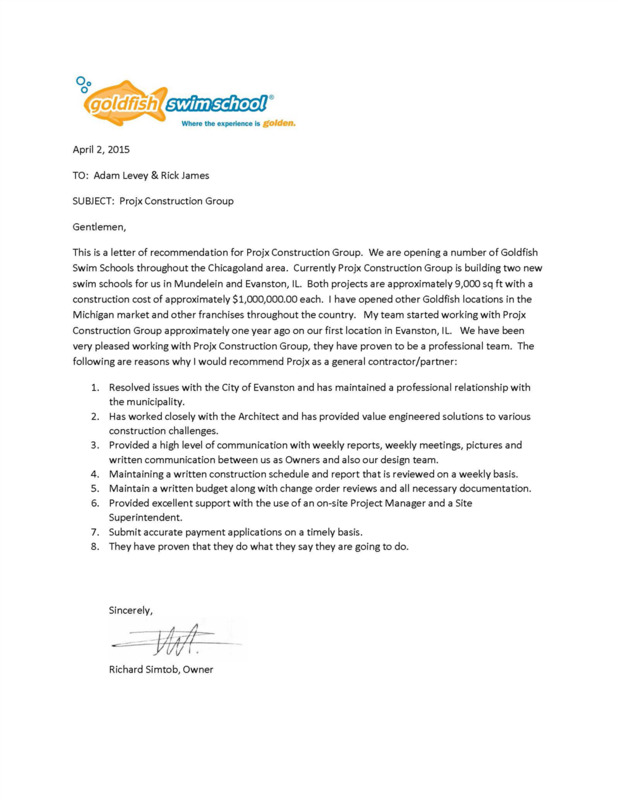 "I wanted to write you today to let you know how much I appreciate working with you and your company Projx construction in building out one of my Goldfish Swim School facilities located in Plainfield IL. As you know, Plainfield was our second location after having our first location built in Naperville, Illinois. When we hired your company, we had expressed to you how challenging the experience was in dealing with our Naperville GC. Not only was it challenging in dealing with this other GC but we are still to this day fixing all their mistakes. Contrary to that experience, Projx did an excellent job in building out our Plainfield Goldfish location. Some of the reasons for this was that from the very start, there was great communication and organization on your part. I always felt that I was included in the process and was always included into any conversations that needed to have a decision made upon. The Subs always showed up on time and stayed and did the work that was needed to complete this project on schedule. I also want to add that the quality of the workmanship was great, with very few problems at the end that were handled quickly and efficiently. One of the most significant reasons that all the above happened was that the superintended on this buildout, Ed Riley, did an excellent job of managing the project. Ed always answered my phone calls and responded quickly to any questions that I had and always came up with a resolution to any issues that came up. I encountered a very good customer service experience and work ethic from your company. Because of Projx’s hard work, organization and successful systems, your company has become the go to General Contractor for all the other Goldfish Swim Schools being built in Illinois. In fact, I believe that your company has now built more Goldfish’s than any other contractor in the US. Those reasons listed and the trust that you have created, have now lead me to hire you and Projx Construction to be my Owner’s Rep in developing and building out new Swim Schools in New Jersey. So far, your team did a great job with going through the process of selecting a very qualified New Jersey General Contractor for these New Jersey locations. Furthermore, because of the practical experience that Projx has in bidding and building out Goldfish locations, you were able to save me a good deal of money on our New Jersey bids. It will also be a great asset to have you oversee and manage the New Jersey projects through weekly phone calls and site visits to make sure that we are on track, on budget and on time. Once again, thank you for all that you done to help me with both my Illinois and New Jersey Goldfish Swim School locations." "We engaged Projx Construction as an owners rep to assist us with our build-out of Goldfish Swim School in Richmond, VA. Given that Goldfish was new to the Richmond market, the GC’s in the area did not have prior experience with the brand. Projx had been the GC for several schools in the Chicago market and we felt they may be able to assist us in working with the GC’s. The initial bids came in and were several $100k over our initial budget. Projx worked directly with the GC’s on our behalf and was able reduce the final bid by $300k! Todd and Mark were helpful, responsive and were able to help us keep our costs in line." "Projx's expertise and thorough approach has saved us valuable time and tens of thousands of dollars." "I would consider Projx a smart choice for Andy's to be our long term GC for the entire buildout in the Chicago Area." "I put complete trust in Projx from the design phase to completion on our beautiful home and I couldn't be more pleased with our decision!"